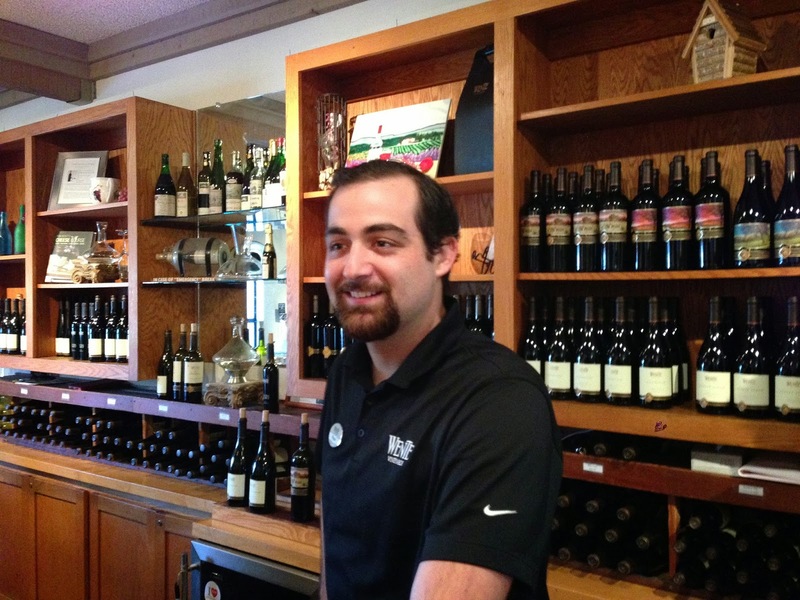 Like most retail businesses, the winery business is very quiet after Christmas. 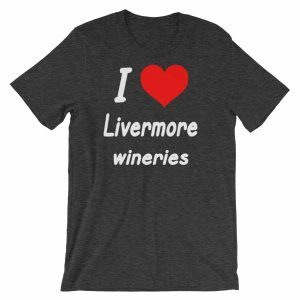 While that is tough on the wineries, it is an excellent chance for all of us to enjoy wine tasting in a quieter, more relaxed environment. 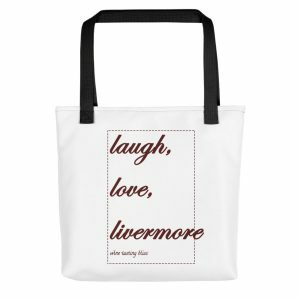 Less waiting also means that we can fit more fun into our day. So that’s what we did on a recent sunny January Sunday. We don’t like to wine taste on an empty stomach, which was a wonderful excuse to sample the Sunday Brunch offerings at The Restaurant at Wente Vineyards. We’ve enjoyed summer brunches on the patio, so we were really looking forward to our return. The meal exceeded our already high expectations. Several of us are, admittedly, Eggs Benedict snobs. It must be said. Wherever we brunch, the restaurant is judged by the tanginess of the Hollandaise and the perfect runniness of the poached eggs. Wente scored high marks on those elements, plus they upped the ante with house-made English muffins! We toasted our day of fun with a lovely glass of Wente sparkling. This very crisp, French-style sparkling had notes of citrus zest and a tart finish that set our palates up beautifully for the Eggs Benedict. 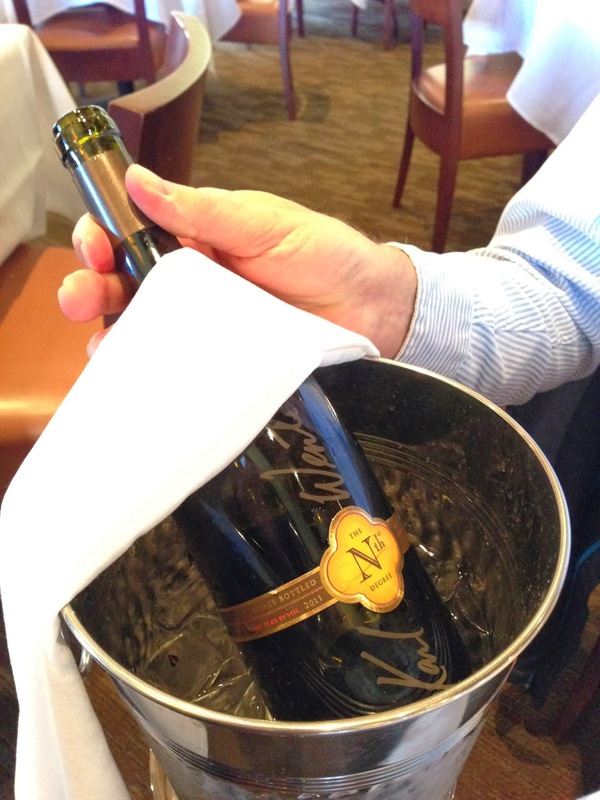 Our friends, who are members of Wente’s Nth Degree wine club, brought in an amazing 2011 Nth Degree Chardonnay. The Chardonnay’s fruit-forward blend of mango, pear, apricot and peach notes, all balanced out beautifully on just enough oak, carried us through the meal and onto dessert. Dessert? But, of course! The dessert menu posed an insurmountable problem: two amazing offerings with no way to choose. So we took the easy way out and ordered both, with four forks. The mocha pot de crème with chocolate pound cake, almond and cocoa nibs was rich and succulent. The chocolate pound cake was a great addition to balance out the dense mocha. 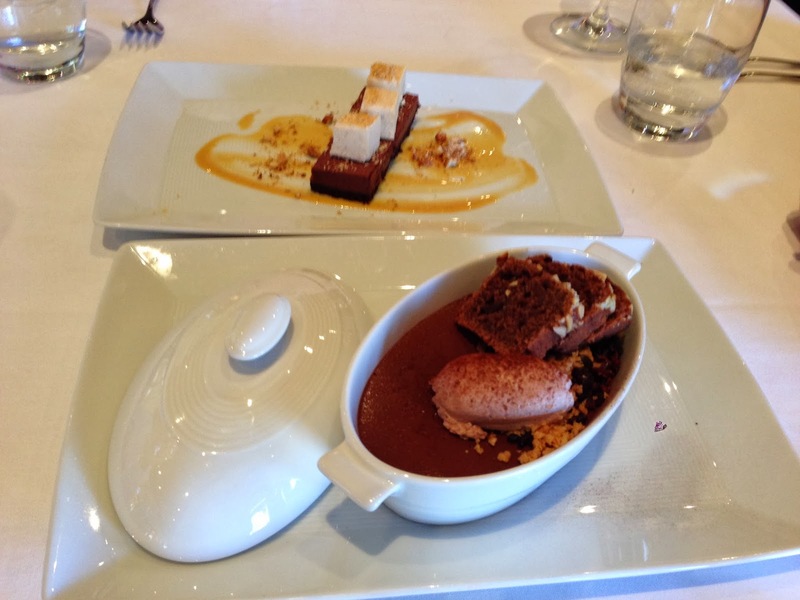 The chocolate cheesecake with salted peanut semifreddo and caramel cremoux was very much a deconstructed wonder. The salted peanuts balanced out the chocolate and caramel perfectly. We clearly demonstrated our ability to handle dessert! 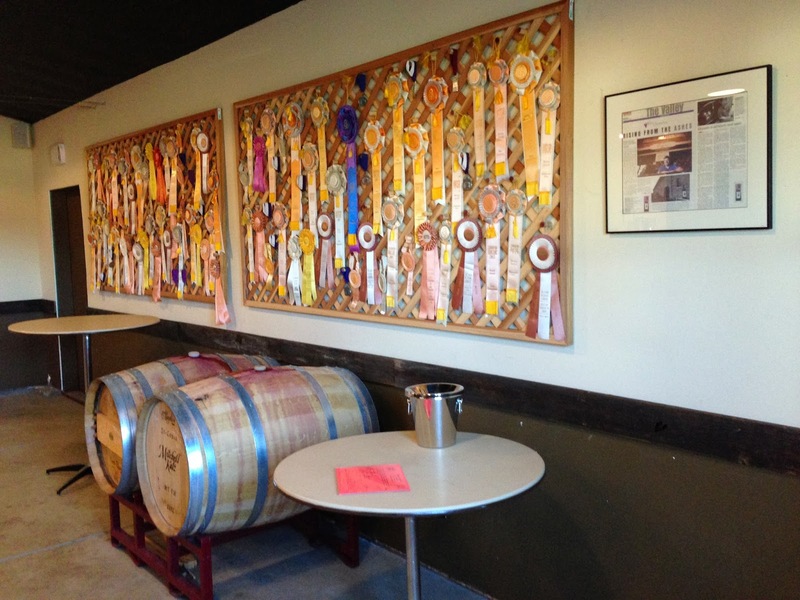 With brunch behind us, we took the short stroll from the restaurant to the tasting room. This is a cozy and relaxing environment, with a clear focus on the wines and the enjoyment thereof. With the lack of crowds, we had nearly half of the tasting bar to ourselves. We were ably assisted by Ryan, who took us through that day’s extensive tasting menu. One unique offering was a Pinot Noir Nouveau. This wine is not aged at all! It is fermented and then bottled immediately for sale. Although this was an interest blend of fruity features, it pairs best with assertive food, like a spicy lasagna or peppery tri-tip. 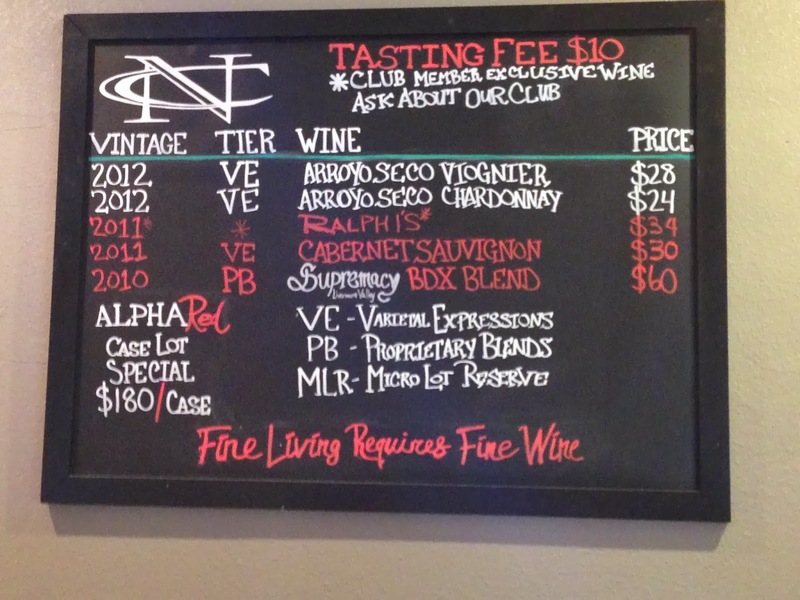 We especially loved the 2011 Nth Degree Cabernet (of course)! Super smooth, with low tannins, this was perfect to sip on while wondering how the 49ers game was going. Many thanks to the tasting room staff for keeping the score a secret so that we could watch the game from our DVR when we got home. We wrapped up our Wente experience with their 2012 Petite Sirah Port. A great closer, this was classic and balanced, with just the right amount of raisin notes. With thanks to Ryan for a fun time, we set off for our next tasting room. 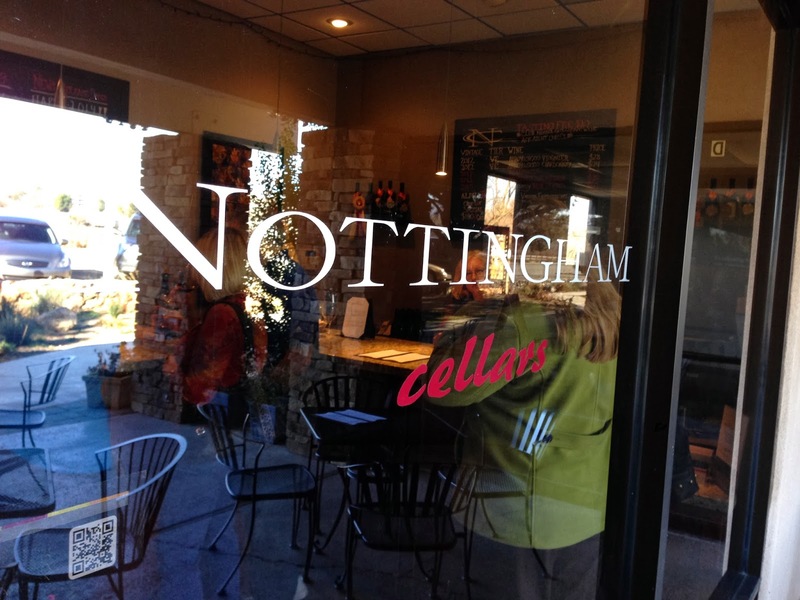 We swung by Nottingham Cellars to check up on their expansion. As we mentioned in a previous posting, Nottingham leased another unit in the strip center. The new unit will house all of their wine making equipment, allowing the original unit to be entirely dedicated to tasting. Everybody wins! It turns out that our visit was one week premature. Oh well, just an excuse to visit them again in a few weeks. 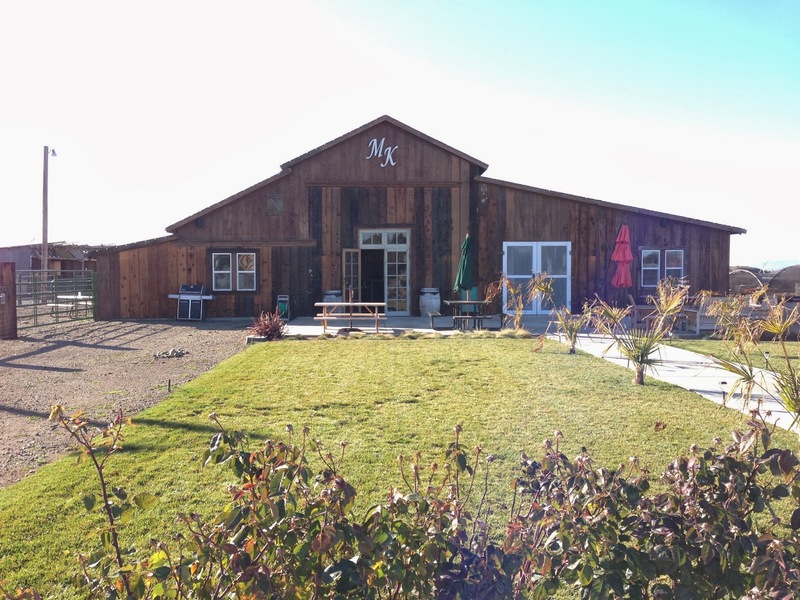 While we were there, we tasted their 2012 Viognier. This is a real favorite (in fact our friends picked up a few bottles while we were there) with its crisp balance of apple and raisin hints. We also loved revisiting their 2012 Chardonnay from Arroyo Seco. The neutral oak gives it a nice balance without too much of a buttery finish. A nicely balanced Chardonnay that doesn’t need cheese to tame it. 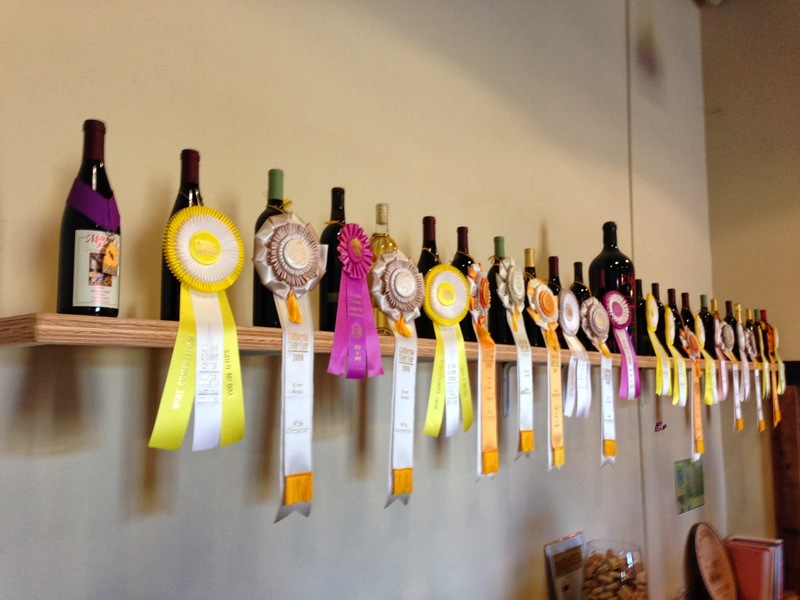 We tasted the 2011 Ralphy’s blend. A mix of cabernet and merlot, this wine surprised us (positively) with berry, cedar and clove aromas and smokey paprika hints. Not your everyday table wine! The favorite of the visit had to be the 2010 Supremacy. A Bordeaux blend, this was complex, yet balanced. Perfectly suited to sip by itself, we also dreamt of pairing it with steaks from the grill. This was so amazing that we tasted it twice. We then previewed the expanded tasting room area and promised ourselves that we would return soon to help christen the new space. Until then, Nottingham! 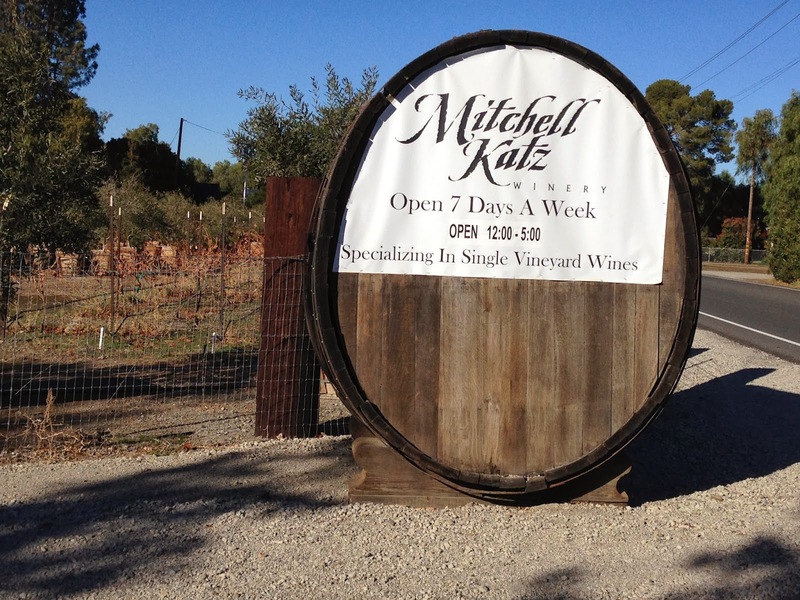 The Mitchell Katz Winery moved more than a year ago, yet we had not yet visited the new facility! This egregious error had to be corrected, so we set off to discover their new digs. Happily, the entrance to the tasting room cannot be missed and the parking was more than ample, especially with the thin January crowd. The new space is airy and inviting, with two separate rooms to cut down on the noise that inevitably accompanies a large group of wine tasters. I especially appreciate that! Debby added to our bliss! 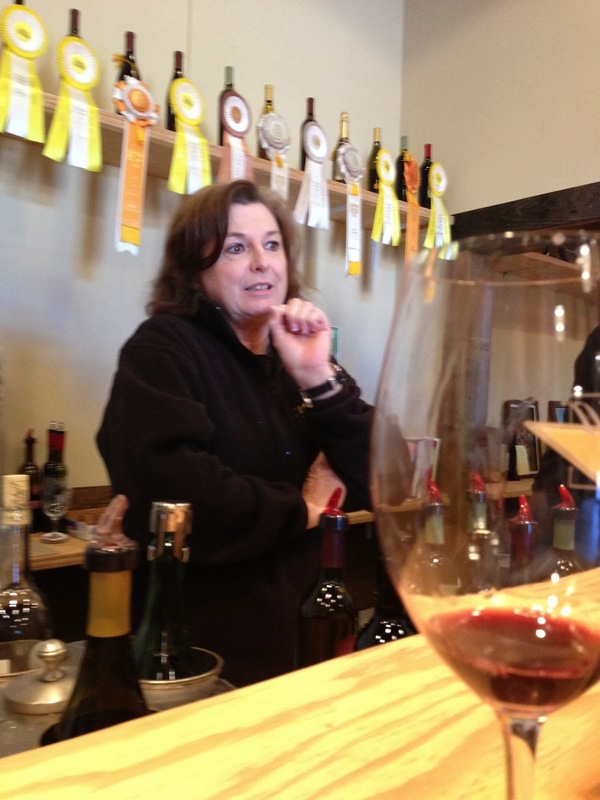 We were greeted warmly by Debby, who added greatly to our enjoyment and understanding of the wines. We started with the 2011 Pinot Gris. Done entirely in stainless, this is a “summer afternoon in the backyard” kind of wine. Well balanced acids with a crisp finish that provides ample opportunities for putting off that yard work you were considering. We then compared the 2011 Shadow Hills Chardonnay with the new 2012 vintage. This is always fun, comparing two vintages of the same varietal. the ’11 had notes of smoke bacon, vanilla and spice. The ’12 had more oak and a bit of grapefruit. Described by one of our party as “shivery” the ’12 will be a wonderful wine in a year or two. We awarded the match to the 2011, but marked the 2012 as one to watch. We moved on to the 2011 Cabernet from Clark’s Corner vineyards. This wine has a great nose, making you long for a cheeseburger along side. Nicely balanced fruit, with a bright happy finish. 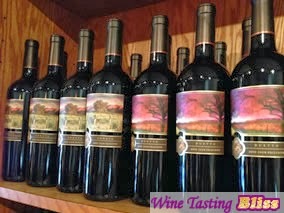 We then tasted their 2011 Merlot from Falling Star vineyards. This merlot featured the fruit, front and center. Spending 24 months on American and neutral oak, we appreciated the slightly tannic, berry finish. The 2010 Syrah (again from Clark’s Corner) was a dark and peppery start to a mid-tongue party. We tasted cocoa nibs and walnuts, some boysenberry and green peppercorns. Not your parents’ Syrah, and well worth a taste! Next up was a 2011 Zinfandel from Del Arroyo vineyards. This was awarded “my happy wine” by one of our tasters. Hints of plum and raisin with just a bit of Zin spice. Definitely a “gateway” Zin for people that don’t think that they can enjoy a zin. We tried the 2011 Wesley’s Blend next. 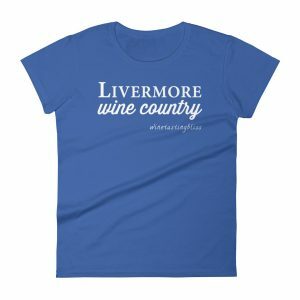 A blend of syrah, merlot and petite verdot, this comes on like a cab and leaves like a zin. A nice dinner table wine, it can stand up to food without stealing the spotlight. The New Mitchell Katz Digs! Our visit finished up with a taste of JK’s Traditional Port. A field blend of Lodi grapes, this port had raisin, orange peel and black cherry hints. Not a all jammy, this is a light port for those who don’t yet appreciate full-bodied (common cold-curing) ports. Nicely done, JK! Sadly, all good things did come to an end. We said our good byes to the Mitchell Katz staff and headed home, already armed with a list of wineries to visit in the coming weeks.